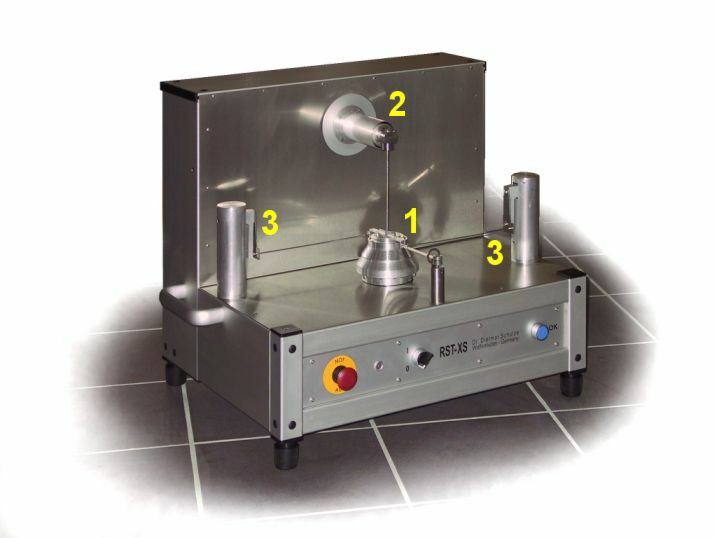 The main part of the Ring Shear Tester is the shear cell (1), which contains the powder specimen. 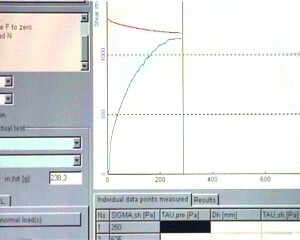 The image on the left a standard shear cell with a specimen volume of 30 ml is set on the tester. The powder specimen is covered by a lid. 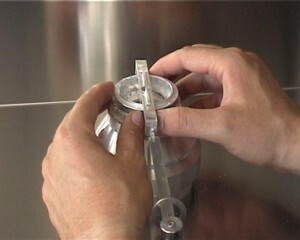 The lid is subjected to a vertically acting force (normal force) in order to apply the stress level required for the test. 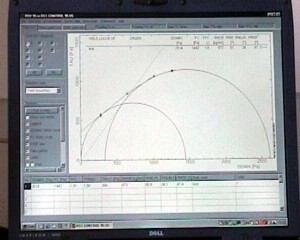 For the adjustment of the normal force serves the computer-controlled normal load system (2). For consolidating the powder specimen and for measuring its strength, respectively, the powder specimen is subjected to a shear deformation. For this the bottom ring of the shear cell is rotated, whereby the lid os prevented from rotation. The latter is achieved by two tie rods, which are connected to the lid of the shear cell as well as to the load beams (3). 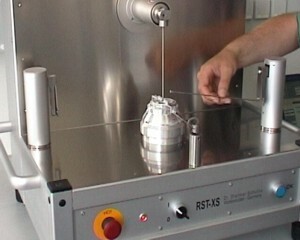 The load beams serve for the measurement of the shear stress in the powder specimen. Since both the bottom of the shear cell and the underside of the lid are rough or provided with vanes protruding into the powder (see image to the right), the rotational movement of the shear cell relative to the lid causes shear deformation of the powder specimen. As an example, in the following the measurement of a yield locus is shown, whereby not only the flowability of the powder is measured, but also the internal friction, the bulk density and other quantities. 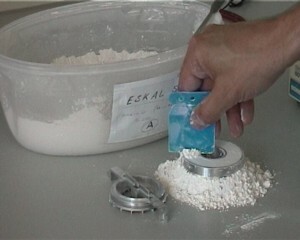 Beside the test procedure shown here, the time consolidation (caking) and the friction between a powder and a rigid wall (wall friction) can be measured. Please note: The images are taken from a video. Thus their quality might be not optimal. We apologize for this. 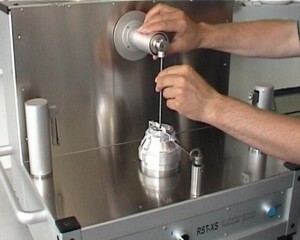 The Ring Shear Tester is connected to the RS-232 communication port of a PC. 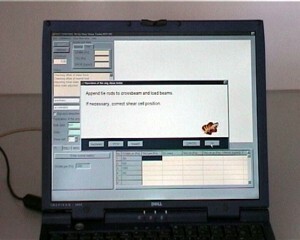 The PC controls the test with the software RST-CONTROL 95. 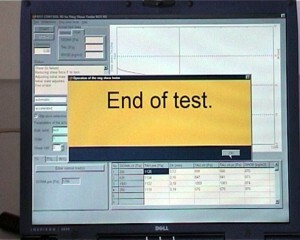 At the begin of a test the test parameters have to be entered. These contain information on the stress level for the test, the designation of the powder, and the number of the shear cell used. The shear cell is filled with the powder. This can be easily done using a spoon. 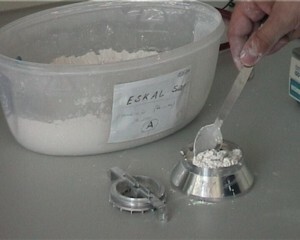 Excess powder is scraped off with a spatula so that the powder surface is flush with the upper edge of the shear cell. The filled shear cell is weighed and then placed on the Ring Shear Tester. 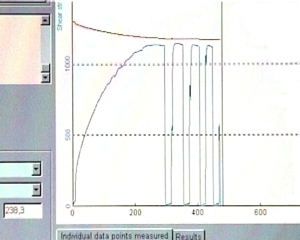 The mass of the filled shear cell is required by the control software for the calculation of the bulk density. then the loading rod is inserted. RST-CONTROL 95 tells the operator what to do next. If desired speech output can be activated. Attachment of the tie rods. Here the Ring Shear Tester is ready for testing. The automatic test procedure begins. At first the normal force acting vertically on the lid is increased to the selected value. Hereby the lid moves somewhat downwards according to the compressibility of the powder. After the normal force has been adjusted, shearing starts. 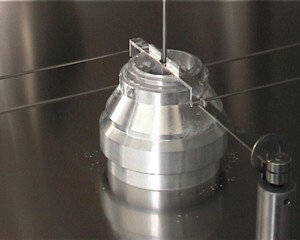 The bottom ring of the shear cell is rotated in the clockwise direction (seen from the top), whereby the lid is prevented from rotation by the two tie rods. 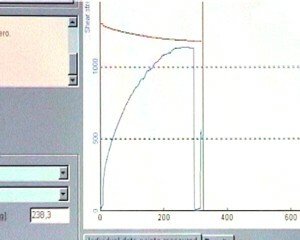 At shearing the shear stress increases with time (see blue curve in the diagram to the right), the height of the powder specimen decreases (consolidation of the powder, see red curve). The abscissa represents the time in the unit "second". When the shear stress does not increase any further, RST-CONTROL 95 recognizes that the powder is sufficiently consolidated. The powder specimen is then unloaded from the shear stress. In the next step the powder specimen is sheared again, but under a reduced normal load. Hereby the consolidated powder fails (incipient flow), which can be recognized by the maximum in the course of the shear stress (see diagram to the left). Subsequently the powder specimen is consolidated again, and again the shear strength is measured, whereby another normal load than before is applied. This cycle is repeated a few times (here: four measurements). From the measured data, especially from the shear stress maxima characterizing failure of the previously consolidated powder, the yield limit (yield locus) of the consolidated powder is determined. The shear cell is removed from the tester and cleaned, the test data are saved. After the test the result is presented as a yield limit (yield locus as defined by A.W. Jenike) of the powder. The table in the top part of the diagram shows the flow properties of the powder, which can be used depending on the particular application. 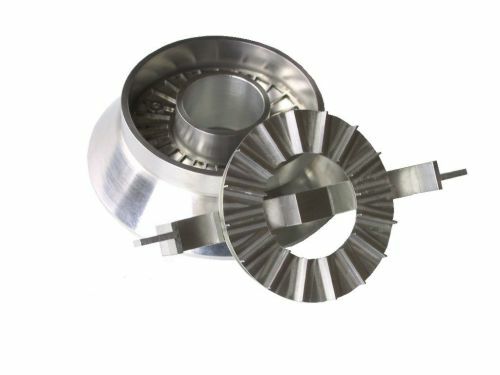 The most important quantity for quality control, comparative tests and product development is the flowability ffc. Beside others, the compressive strength (unconfined yield strength), the bulk density and the internal friction are listed in the table. The results can be presented and saved as numbers or diagrams, or exported to other applications (word processor, spread sheet). The duration of this test was about 500 seconds for the automatic part. The time required for filling, weighing and setting up the shear cell prior to the test, and for removing and cleaning the shear cell after the test has to be added, so that about 15 minutes for a test are a realistic number. 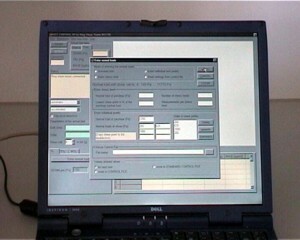 Thus an operator is required for only about 5 minutes per test, the rest of the test is performed computer-controlled. © 2003-2014 Dietmar Schulze. All rights reserved. Last updated: August 28, 2014.